Magneti Marelli Technologies on many international previews presented at the 2016 Geneva Motor Show. The focus is on the Maserati Levante, the Ferrari GTC4Lusso and on the new Alfa Romeo Giulia range. Featured at the 2016 Geneva Motor Show is the new Maserati Levante presented as a world preview, for which Magneti Marelli supplies technologies in the field of electronic systems and lighting. The Maserati SUV has adopted the Magneti Marelli instrument cluster that reflects the style of its other models, The instruments cluster is characterised by circular elements for the tachometer and speedometer, to which is added a 7” (15:9) TFT (Thin Film Transistor) colour display with a resolution of 800x480 pixels. From Magneti Marelli are also the rear lighting systems, characterised by full-LED tail lights whose design is emphasised by the high illumination uniformity. When reversing, the tail light illuminates the ground to provide better visibility to the rear camera while. Magneti Marelli also provides suspension components for Maserati Levante. Following its debut at the 2015 Frankfurt Motor Show, the Alfa Romeo Giulia range is officially presented in Geneva in the petrol and diesel engine versions that will sit alongside the top of the range vehicle, namely the Giulia Quadrifoglio. Magneti Marelli supplies the halogen and adaptive Xenon headlights, the LED tail lights, the new infotainment system with TFT display of up to 8.8", with "black panel" effect, which integrates innovative "optical bonding" technologies designed for perfect screen readability. Magneti Marelli also offers the body computer, components for rear suspensions, exhaust system and Powertrain components for the 2.0 petrol engine (electronic control unit, intake manifold) and for the 2.2 diesel engine (throttle body and intake manifold). Relevant, even though it is already known, is the contribution to the Giulia Quadrifoglio with the CDC (Chassis Domain Control), the electronic control unit jointly developed with Magneti Marelli, which is the "brain" of the on board electronics to optimise handling and performance. On the new Ferrari GTC4Lusso, Magneti Marelli contributes with its systems and components in the area of powertrain control (hydraulic kit and management control unit of the Dual Clutch transmission) and of electronic systems (Body Computer). With regard to the lighting systems noteworthy are the full-LED tail lights made by Magneti Marelli Automotive Lighting. The tail lights are characterised by rings of light that give them the effect of being "in suspension". The brake lights and the indicators emphasise the circular design that distinguishes the tail lights of Ferrari cars. The rear fog light function includes three high-power LEDs to increase efficiency in case of poor visibility. Magneti Marelli also supplies the pedal box for the new GTC4Lusso. With regard to the new Fiat 124 with world preview at Geneva, Magneti Marelli is a supplier of the exhaust system for the MultiAir turbo 1.4 engine and for the various Powertrain components such as the ECU (Engine Control Unit), the air intake manifolds, the throttle body and the fuel injectors for the same engine. For the Fiat Tipo, also displayed in the Station Wagon version at the Geneva Motor Show, Magneti Marelli supplies Powertrain components for the 1.6 petrol engine (engine control unit, motorised throttle and sensors) and for the 1.6 (intake manifold and motorised throttle) and 1.3 (engine control unit and motorised throttle) diesel engines, exhaust systems, shock absorbers and suspension components. Moreover Magneti Marelli Automotive Lighting supplies the headlamps and the rearlamps. Magneti Marelli is also present at the FCA stands with a series of multimedia supports. At Alfa Romeo, an interactive wall, created with Microsoft Kinect technology, allows visitors to navigate virtually within the Alfa Romeo Giulia thereby increasing their knowledge on the Alfa Romeo and Magneti Marelli technologies. With the same logic, at the Fiat stand there is a Magneti Marelli interactive totem, with touch-screen technology, dedicated to the new Fiat 500S which features all the Magneti Marelli technologies already available on the Fiat 500 range. 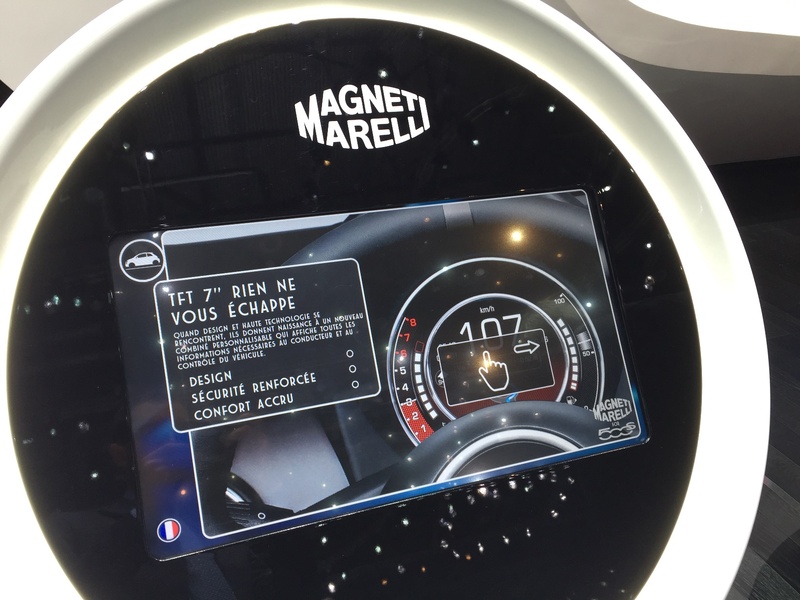 Navigating on the display, it is possible to discover the new front and rear light groups of the car made by Magneti Marelli Automotive Lighting, in addition to the digital 7" TFT digital instrument cluster and the Dualogic robotised gearbox. Two cars are equipped with a demonstration instrument cluster, created ad hoc by Magneti Marelli: the screens that reproduce the main functionalities of the system are visible on the TFT screens of the Fiat 500S and of the Jeep Renegade Trailhawk. In the field of electronic systems, the Magneti Marelli infotainment system is adopted by BMW to equip the new 5 Series and 7 Series. The infotainment system adopted by BMW is based on an "open source" technology concept and offers, in its most advanced version, a sophisticated set of features, including navigation, brilliant graphics, Internet access and connectivity including wireless. On the 7 Series Magneti Marelli Automotive Lighting provides as well the LED tail lights. On the Opel Astra, winner of the prestigious "Car of the Year" award, Magneti Marelli is present in the areas of Powertrain (AMT - Automated Manual Transmission available and TCU - Transmission Control Unit) and of lighting (tail lights with incandescent lamps and LEDs). Peugeot introduces in Geneva the new 2008 and Expert, each fitted with a Magneti Marelli navigation system with 7" high-resolution touch-screen display (800x480 pixels). It is a modular device that plays music and displays photos and provides, in its most advanced version, an Internet connection via USB. Magneti Marelli Automotive Lighting provides illumination systems on the Mercedes-Benz C-Class Convertible with halogen and LED headlights also in the full-LED Multi-Beam version (LED full beam with adaptive system for the guidance of the light beam through the LEDs' camera controlled activation). There are LED tail lights on the new Renault Megane. Powertrain components are evident on the new Seat Ateca. For the SUV of the Spanish manufacturer, Magneti Marelli proposes a throttle body for the 1.0 and 1.4 petrol engines. A throttle body is also present on the Skoda Superb Wagon and Skoda Vision S.
The Geneva Motor Show will be open to the public until 13th March. Magneti Marelli designs and produces advanced systems and components for the automotive industry. With 89 production units, 12 R&D Centres and 30 Application Centres in 19 countries, approximately 40,500 employees and a turnover of 7.3 billion Euro in 2015, the Group supplies all the major carmakers in Europe, North and South America and the Far East. Business areas include Electronic Systems, Lighting, Motor Control, Suspensions Systems and Shock Absorbers, Exhaust Systems, Aftermarket Parts & Services, Plastic Components and Modules, and Motorsport. Magneti Marelli is part of FCA.